The Pink Lady is quite a catch. Sweet, rosy, plump and smooth-skinned, she's popular with men, women and children, too. Pink Lady apples are a modern breed, developed in the 1970s in Australia. They require a hot climate, and are mostly grown in the southern U.S., southern Europe, South Africa and Australia. They keep well, and you can usually find them hanging around long after apple season is through. Pink Lady apples are medium in size, but pack fewer calories than you might think. According to the official Pink Lady website, an average 100 gram apple has only 50 calories. That's slightly less than the average medium-size apple; the USDA states that a 182 gram apple should have 100 calories -- 55 calories for a 100 gram apple. Pink Ladies, like other apples, contain no fat and no sodium. According to the Specialty Produce website, Pink Lady apples are about 10 percent carbohydrate. For a 100 gram apple, that works out to 10 grams of carbohydrate, or 3 percent of the recommended daily intake for a 2,000 calorie diet. Eight grams of these carbohydrates are sugars, mostly fructose. The other two grams are dietary fiber. You'll find fiber in both the skin and the core, though most people don't eat apple cores. The fiber in the skin provides about 9 percent of your recommended daily intake for a 2,000 calorie diet. Pink Lady apples are a good source of vitamin C. A 100 gram apple provides almost a quarter of your daily vitamin C recommendation, according to the Specialty Produce website. Almost half the vitamin C is found directly under the skin, however, so you should eat the apple with the skin on. Apples also provide some vitamin A, calcium, iron, boron and pectin. However, they contain no protein. Pink Lady apples are good to eat fresh. Their flavor is rated as "good" by the reviewers at "Orange Pippin." Pink Ladies are slightly tart and very sweet, with a strong and pleasant aroma. They are very crisp, with thin, smooth pink-red skin and white flesh. According to the Pink Lady website, these apples are made up of 10 percent carbohydrates, 4 percent vitamins and 80 percent water. 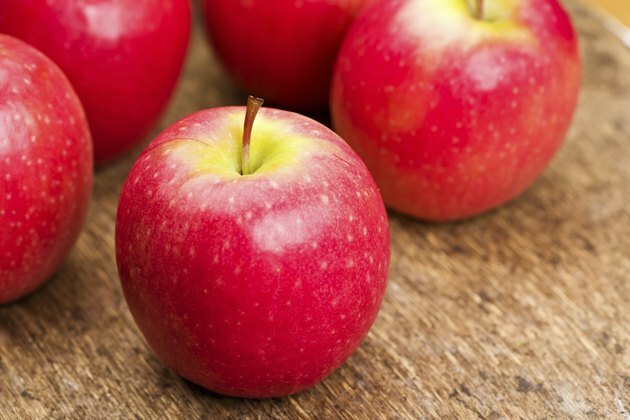 Pink Lady apples can be incorporated into healthy recipes, and also make good snacks and desserts. The USDA recommends dipping apple slices in peanut butter or serving them with crackers and cheese to add protein and fiber to your snack. They go well with pork and poultry, which also provide needed protein. You can bake Pink Lady apples with sugar and wine or juice, although this adds carbohydrates without added nutrition.